This stroller has been an absolute lifesaver! We purchased it for my parents since they watch the kids while I am at work and it has been amazing. 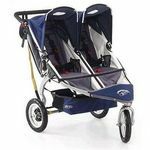 They are able to fit the toddler and the infant in the stroller, plus it fits very easily into their sedan. Our kids love the huge canopies and we love that it is so easy to stow and to set up. We've taken this on road trips and to Disney. This is worth every penny I paid for it! I am a mother of two small kids one is 2 years of age and other is 4 months so a product like this would be fantastic to have verses carry one on hip. Only con is if you don't have much trunk space it could be to bulky to fit a standard sedan trunk. On a another note the price point for this stroller will turn heads. As a mom of three children, ages 4 years and younger, I've been extremely happy with the City Mini Double stroller. I find it easy to fold, maneuver, and most importantly, my children seem to love it as well. Design The sun shades are great. They provide excellent coverage, while still providing my littles ones the ability to look around. Maneuverability The stroller fits through every doorway I've encountered. My husband and I rented this stroller for 8 days when we took our boys to Walt Disney World. This was our first experience with a double stroller because we usually carried our younger son in a carrier while we pushed the oldest in the stroller. However, I was about 7 months pregnant with our daughter and we thought it best to get a double stroller. Our boys were ecstatic when they saw this stroller! They were so excited to be able to sit side-by-side. The design is great. We LOVED the capability to recline the seats all the way back! It was so great to be able to let the boys sleep comfortably in the stroller while we roamed the parks. They were more rested during the day without us having to leave and head back to the condo that we rented. We also loved the huge canopies. You have the ability to pull it down to a standard size or even further for the times the sun is directly in front of you and hitting the babies in the eye. Another bonus for us was the ability to have a place to store our bags when one of the boys wanted to walk. The not so great features were that the basket underneath was pretty small. The stroller is also pretty bulky. We rented a SUV, which came in handy, but I could see having a smaller car being an issue. All in all, great stroller, easy to maneuver, just a little big. This is the best double stroller! 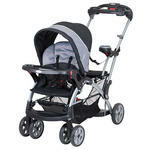 It is so easy to maneuver and feels very light compared to other double strollers. I use this very often and it's still in great shape. Very comfortable ride for the kids too! Design Very comfortable for pusher and kids. Safety Very secure! 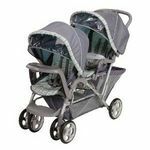 We registered for the City Mini double stroller on recommendation from other parents of multiples - several different families suggested this stroller as THE BEST and they were right from our experience. Expecting twins we knew we would need a functional and easy-to-use stroller. City Mini double fit the bill! Of all the strollers we've used the City Mini is still the simplest to open and collapse. 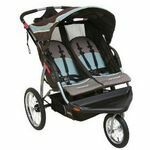 It is larger than an umbrella stroller when folded, but this sturdy and impressive stroller is in a different category altogether from umbrella strollers so they really can't be compared in that respect. We appreciated the smooth ride and generous capacity of the seats, which carry an impressive weight limit ensuring a long, useful life for this stroller. The sun canopies are exceptional and great for protecting kids from sun, wind, rain, etc. The 5-point harnesses allow use of this stroller from birth on. We found the storage to be decent both under the seats and on the seat-backs. For us, it was necessary to purchase both the belly bar, as well as two parent consoles to install at the handles. Those items contributed to safety in use, as well as functionality. 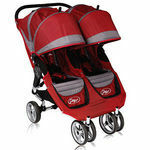 We recommend this stroller to all parents of twins or multiple kids close in age. Our friends with the single style City Mini are equally pleased with the single stroller. With respect to size, the double is a bit narrower than a standard wheelchair and we had no issues getting thru any doorway we encountered. That was an initial concern, but never became a problem. This is a great stroller. I've had it for nearly two years and love it. I originally got it because it was one of the few side by side doubles that would fit into my Honda Civic. It folds small and still left room in the trunk. With nearly two years of use, it still seems almost new. It's handled the wear and tear given to it by my 2 and 3 year old and I'm looking forward to using it this Spring with my newborn. My only complaints are the lack of storage space and that I find it a little hard to close, it usually takes me at least an extra try to make sure I've got all the buttons push and cords pulled. Also, I wish it had a latch to keep it closed, but if it isn't bothered it stays shut pretty well on its own. It handles great on sidewalks and requires a little extra effort on tougher terrain, but so far for me it's never gotten stuck. Other than that it's great and I like the accessory you can buy to allow an older child to stand on the back. Overall, great stroller. We bought this stroller when we were expecting our twins. My husband did a lot of research on strollers and we chose this one based on the reviews and how long it would last us. Our twins are now three and still fit in the stroller just fine. We also have a five-year-old daughter who still fits in this stroller. It's large in size but still easy to maneuver even with two kids in it. It fits through most doors and I can easily push it and turn it even with one hand. It folds up pretty easily but will probably take up a lot of space in the trunk of a car. Cons: After three years, one of the front wheels on our stroller got stuck in the locked position which makes it difficult to steer. My husband figured out he could just put a small stick between the lock and wheel post to keep it from locking up. We're not sure what caused this problem, hopefully its not a design flaw. The storage area under the seats is decent sized, but a bar running across the bottom makes it difficult to put anything larger than a blanket underneath. Despite these flaws, we love our stroller and recommend it to everyone. We would definitely buy it again.